Beasts in Their Wisdom, Stories by Eugene K. Garber, Illustrations by Lynn Hassan. 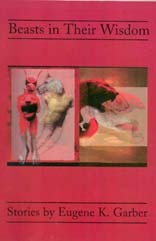 Snail's Pace Press, Inc., Cambridge, New York, 2004.
Review by Ricardo L. Nirenberg. Offcourse readers have had occasion to enjoy, mull over and admire Gene Garber's stories (Offcourse, issues # 10, 13, 17): here's a collection of ten more, nine of which have appeared earlier in literary journals  Kenyon Review, TriQuarterly, Paris Review, Michigan Quarterly Review, and others  not quite as prestigious as Offcourse, yet not a ragged bunch, undeniably. "As April advanced and the feeder swarmed, a great gray hawk began to lurk in the back woods. He was wary, but occasionally they saw him float out above the trees on a high wind, spot his prey, a sparrow perhaps, stoop and strike. The burst of feathers, he told me, was like the flak in the old war movies  a little thump, a pleasant puff which broke up instantly into a gentle gauzy shower." "What do you suppose we sail over this minute, captain? A pretty Atlantis, home to gentle naiads? Nay, rather drear cliffs and valleys with lantern-eyed creatures crawling in the sediment of eons... Never imagine, captain, that our real masters are mere men. They are always vastnesses hungering for our occupancy. God knows why, given our composition." (Page 101). The conspicuous, symbolic, old-fashioned Americanism of the old gentleman who is transporting cattle in the hold of the sailing ship, cows and bulls to populate the vast new continent with, is here, in "Beasts," deftly and minutely paralleled, in alternating sections, to the story of a present-day woman painter, married to the owner of a salmon hatchery, and her confrontation with a large, white canvas. Paralleling is a favorite device of Garber's; in all these stories you will find multiple parallels, some hidden, some overt, between the fates of animals and humans. Let me just give a few examples, prime the pump for you as it were. To start with, canvas and sail (in each case, the means of conveyance); then, the stability and safety of the ship depends, during a storm, on not letting the bulls get to the cows, and the success of the woman painter depends on not letting her husband, who is sexually as potent as a bull, impregnate her. The absence in her mind of the creature she would be painting "went to the pit of her stomach, a nauseous balloon of effete gas" (page 102), while the mountainous ground swells of the sea "causes the old gentleman's stomach to churn up an unpleasant gas" (page 103). The old gentleman and the vast new continent are, no doubt, the stuff of legend or myth. At the very end, in any case, it is she, the present-day, real painter, the one who "flew, beyond the mountain, out over a vast continent of green." The struggle of the painter, an artistic struggle with symbols, is symbolized by the symbolic struggle of the old gentleman and the captain with the abyss; note that the painter is a woman, and that on the (legendary) ship, the author emphasizes, there is not a single woman. Which brings me to a dominant theme. It is always a woman, in each of these stories, who has life power. Emphatically, not merely the power of reproducing life, but rather the power of organizing life, of giving life a sense, a sense which is  how could it be otherwise?  symbolic. And also the therapeutic power of transmitting life power to those who are about to fall or to let go. Woman here, in other words, has mythical dimensions: she is Eve saving Adam, ever frightful and timid, from the dreadful, everlasting boredom of Eden. Gene Garber's strong female characters in general  not only the painter in "Beasts" are, more properly speaking, not mythical but mythopoeic: they will get hold of a myth and save it from terminal sclerosis and old-gentleman-encrusted arteries, they will make it new, infuse new life into it. Goethe's "Das Ewig-Weibliche zieht uns hinan" could be the epigraph of this book. It is not an easy book: Garber's stories are, for the most part, not the kind where a cursory first reading can extract a satisfactory meaning even if to mine the richer ores one may need (many) more readings. Here we must start off slowly, carefully and intelligently if we are to get our money's worth. But if you apply yourself to it, you will be repayed a thousandfold as rich and richer layers of unsuspected meanings open up. If you take this as a challenge to your reading and interpretive skills, so it is intended: go and buy the book, or borrow it and read it. You will enjoy the illustrations too, and you can thank me later. One more thing, about the small press which published the book. Snail's Pace Press in Cambridge, New York, is run by two people, Darby Penney, Publisher, and Ken Denberg, Editor. Ken is a poet, and he, too, has contributed to Offcourse several times (issues # 9, 13, 17). You see how the plot thickens. Beasts in their Wisdom may be purchased from The Book House at Stuyvesant Plaza, Albany, NY.